While you’re reading this, Google the German archaeologist Vinzenz Brinkmann. The recreations of Greco-Roman sculpture that come up simply look wrong; Brinkmann’s research suggests these famous bronzes and marbles were originally painted with day-glo colours which look more at home on twenty first-century sportswear. The idea of the ancient world passed down to us by the Renaissance, Romanticism and the Victorians has made us prefer our classicism in cold white, or patinated bronze. This is why most of Andrew Lacon’s Marble(d) (2015) looks as though it could support a dignified portrait bust – it’s a four-sided white Carrara marble column, its surfaces sanded in circular patterns. The very bottom of it, though, has been dipped in bright, marbled paint, so that a simulated effect covers the thing it simulates. Photographed in isolation, it’s an oddly elegant object. 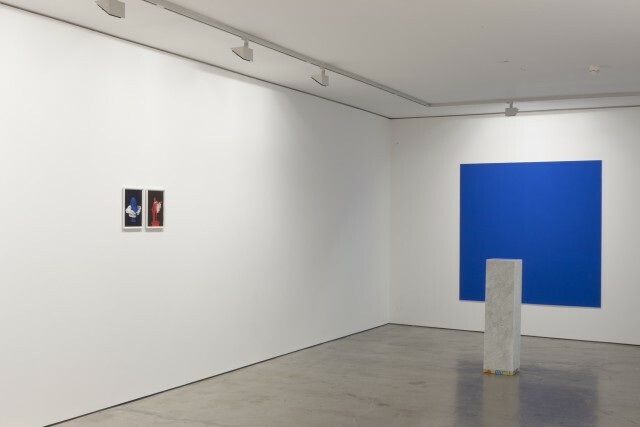 In the context of Lacon’s new show for Division of Labour at Edel Assanti, London, it’s part of a rich pattern of interlocking reflections on the peripheral technologies of sculptural display, from colour, to plinths, backdrops and photographic documentation. The way it’s arranged, then, is vital: diagonally across from Marble(d) is Three Coloured Plinth (2015), which sketches out the same amount of space in thin steel struts, topped with three layers of green, white and red marble. Lacon had the extravagant tones of Bernini’s Cornaro Chapel in Rome in mind, but there’s also a neat elegance to the way the top of one column refers to the bottom of the other, in much the way a photographic lens produces a negative image. As soon as you notice this there’s suddenly a sense of space being controlled across the gallery, and it becomes a sculptural camera obscura: one empty column is a negative of its solid other, in the senses both of the coloured patterns left by light on film, and the volumetric patterns left on space by sculpture. Over on the back walls are the Sculpted Image series; Giclee screen-prints of the busts we might imagine on these columns. Their backgrounds are blacked out, their surfaces washed in colour, and their drapery kept the tone of white marble. By the sculpture’s illusionistic logic, the drapery should be the outer layer, but it appears in the colour of the underlying material. The colours themselves refer back to Marble(d), and the endpapers of the sort of book this sort of reproduction would originally have appeared in. Perhaps, then, the two large panels of almost-uniform, red and blue marble-based pigment which frame the two plinths are the covers of the book. But they also allude to an older display technique in which fields of colour animated sculpture by reflecting light back on it. In 2011, Daniel Campbell Blight spoke about Lacon’s working-class background, and likened him to George Shaw. The work here feels at a distance from this, but the riffs on status, and the historic authorities of material, form and institutions have become clearer. This is a show about who gets to see sculpture, and how.